Found 4 file extension associations related to Typinator and 3 file formats developed specifically for use with Typinator. Typinator is here to save your time by "typing" these frequently used text blocks (also known as boilerplates) and images for you. You just define your list of abbreviations once, and Typinator will automatically expand them as you type. Whenever you are writing text, you probably find yourself typing the same words or phrases again and again. Whether this is your name, your e-mail address, the URL of your home page - or if you often need quick access to images like your signature, location map, or company logo. Typinator is also very useful as an auto-correction tool. 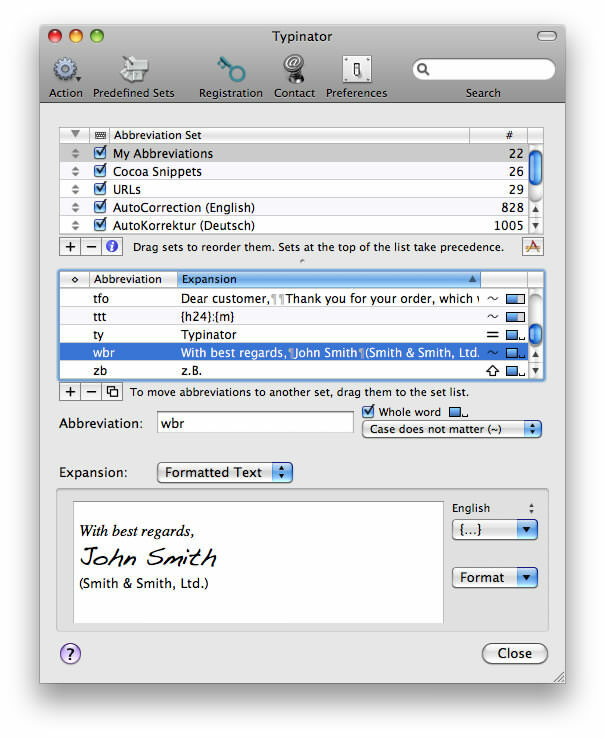 Typinator comes with thousands of predefined corrections for common typos and misspelled words for the languages English, German, and French. Out of the box, it will automatically correct your misspellings - not only in MS Office applications, but system-wide in any application. If you need more information please contact the developers of Typinator (Ergonis Software GmbH), or check out their product website.